Home / Journal / Creating just for the fun of it. Creating just for the fun of it. Harriet is 7 and a few weeks ago she drew me this beautiful picture. I have been a guest speaker at Harriet’s school during art week a few times over the years. I have gone into lessons armed with a single pen and talked about growing patterns from our imagination – doodling really. I am not a teacher (that much was very clear) and I wasn’t there to teach art. What I hoped to pass on to the children though was a sense of how powerful and unique their own imaginations are. Sometimes the tools we use and the choices they present us can get in the way. I know it’s tempting to use all the colours and all the brushes, but sometimes too many options can stifle creativity causing us to second guess our actions rather than go with the flow. And I’m not just talking about children here either. 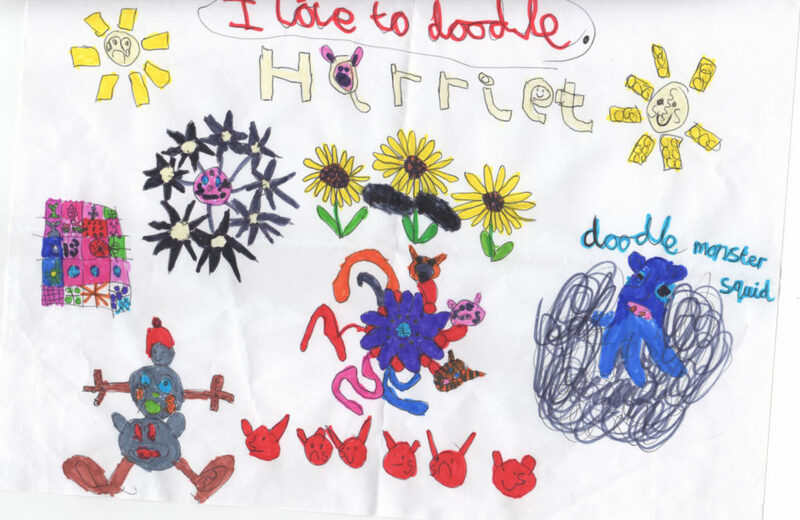 I was really touched by Harriet’s drawing; the time and effort that it took her and for her then to give it away to me. And when I asked her fathers permission to show her artwork on here, he told me about how much he had enjoyed watching her draw it and use her imagination with no restriction or goals. No right or wrong outcome, no possibility of it being marked or judged. Just Harriet drawing for the fun of it. Around this time I was listening to the audiobook of Big Magic by Elizabeth Gilbert. It turns out this book was just what I needed and has really altered the way I think about creativity. Not that I had a fixed position on it, but listening to Elizabeth talk while I was working was like having a little cheerleader on my desk. I felt like I was being given a permission slip to have a go. I should make it clear that I’m not just talking about artwork here, I’m talking about creativity in general, anything. Making a cake, sewing a cushion, writing a poem, choosing an outfit, putting up a shelf, singing in the shower. Anything that nourishes that creative part of you. We often don’t get over the starting line with our ideas because we’ve imagined a million outcomes already, most of them pretty negative. But whatever ideas you have brewing make sure some of them see the light of day. We often define ourselves by our paid work, but we can all be poets and artists and dancers, we don’t need a payslip or a round of applause to validate our creativity. We just need to be brave enough to have a go just for the fun of it.